Our consulting draws on constantly updated research and hundreds of case studies from around the globe. We provide services that simplify and target efforts to produce business results. Put the Business First - We enable organizations to get the most out of their people, and enable people to get the most out of their organization. Simplify and Focus - The business climate is complex enough, our job is to simplify. Take a Targeted Approach - We meet our clients where they are, providing the right level of engagement and the right deliverables from a wide array of engagement styles and levels of involvement. Our consulting helps drive successful learning strategies to keep pace with the constantly evolving business. 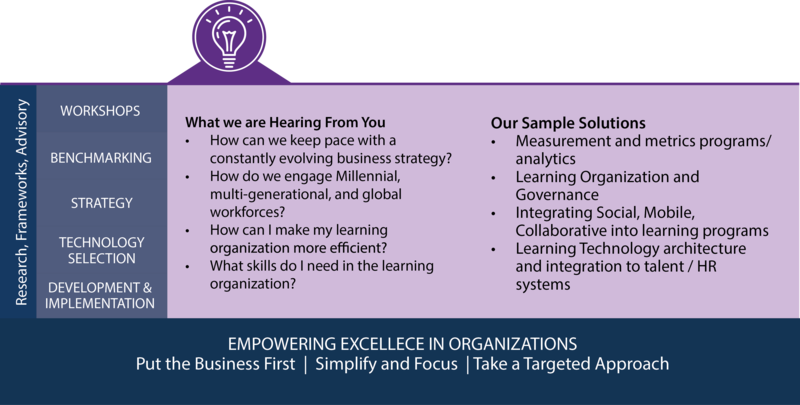 We leverage our industry leading research on budgeting, organization, technology and learning trends, along with hundreds of case studies to provide leading edge service to help your learning organization deliver results. Our consulting helps create and execute talent strategies to create and sustain employee engagement and retention, develop leaders, and improve organizational capacity. 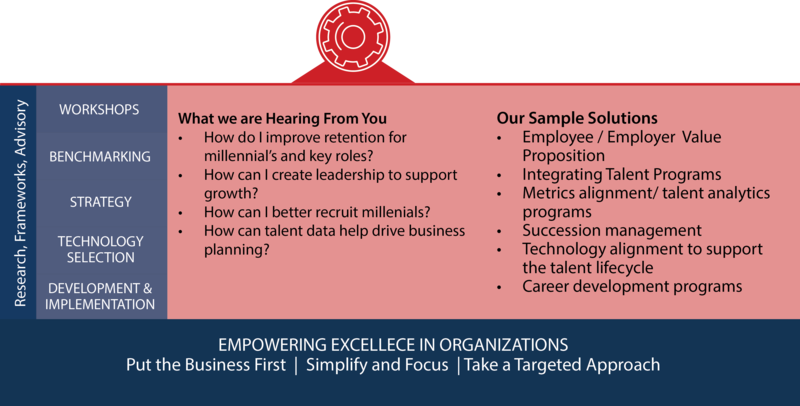 We leverage our industry leading research on talent strategies, program integration, and talent trends, along with hundreds of case studies to provide leading edge service to help your talent organization deliver results. 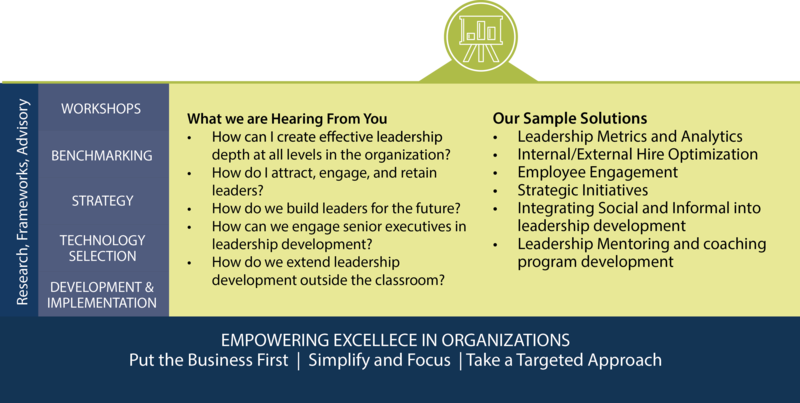 Our consulting helps drive sustainable leadership development programs that leverage the latest tools and trends to accelerate leadership development and attract top leaders to create a competitive advantage for your organization. 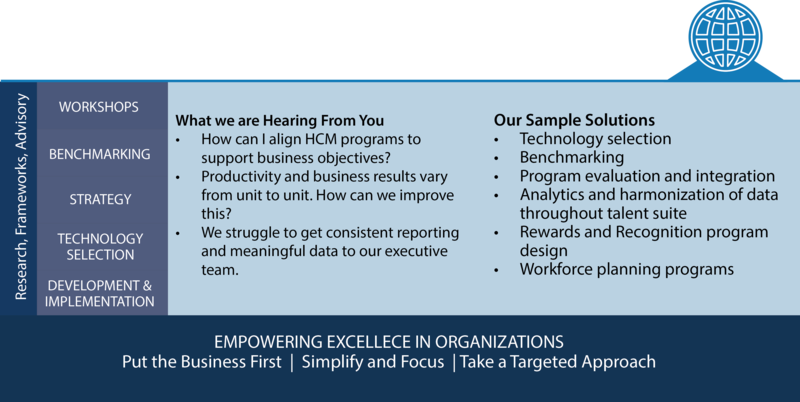 We leverage our industry leading research, along with hundreds of case studies to provide leading edge service to help your talent organization deliver results. 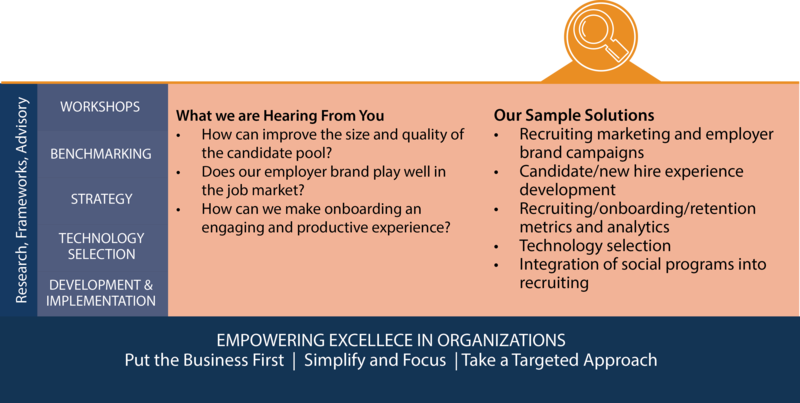 Our consulting helps drive effective talent acquisition programs that leverage the latest technology and thinking in employer branding, candidate experience, and candidate relationships management and analytics. We leverage our industry leading research along with hundreds of case studies to provide leading edge service to help your acquisition team deliver results. Our consulting helps drive effective workforce management through development and delivery of programs that driver productivity and performance. We leverage our industry leading research along with hundreds of case studies to provide leading edge service to help your acquisition team deliver results. Education workshops – designed to align groups on the possibilities and challenges of building and updating programs. Based on our research, these workshops cover a range of topics from market landscape to best practices, tuned to support your organizations needs. Decision-Making workshops – designed for executive-level decision making, these workshops start by benchmarking your organization’s programs against our extensive knowledge of best practices, gained from our extensive research and hundreds of case studies. We then develop an interactive workshops for your team to arrive at the key decisions needed to build a business case, launch and new program, or make decisions on updated existing programs. Drawing from our large collection of case studies and research, our benchmarking helps you “size up” your programs against industry trends, similar organizations, or specific criteria to suit your goals. We focus on understanding your culture and business objectives to help select the right comparators. Benchmarking programs should account for who you are and what you need to accomplish as well as environmental factors, and not focus solely on what is considered “best in class” today. We leverage our knowledge of maturity models and how program integrate to help you decide what “good” looks like. It’s critically important to get it right when it comes to excellence, and being great and the right things far outweighs being really good at everything. have a specific need? We can align our research methodology to support collection of specific data points to develop custom research that supports developing your competitive programs. Based on our frameworks, our strategy offerings focus on your program's success thought your organizations environment and success levers to maximize your return on investment. Our program development efforts focus on the detailed design and implementation of programs, so you can focus your resources on delivery excellence. Designed to align program goals to help achieve business results, align resources in a deployment model suited to your organizations needs, for efficient and effective delivery, measurement and monitoring. Based on our research, our strategy team uses our frameworks that provide context, process, and success levers to focus effort where its needed to gain maximum results. Our team works with you to assess program needs and define business benefit, build the business case, gain stakeholder and executive level support and create an implementation roadmap for your program. If you need to replace outdated technology or add additional capability to your existing HCM landscape, our knowledge of vendors and platform choices enable us to guide you quickly to a technology that fits your needs. We save you time working through the large list of potential applications by shortlisting vendors based on your high level requirements. We help you find the right technology, for today and tomorrow, b y developing experience- based use cases using UX design principles, focusing vendor demo’s and functionality evaluation on real-world cases that account for the user experience as well as administrators, IT staff, and managers. Built from our proprietary surveys and interview instruments and based on our proven research methods, our custom research can inform your strategic planning and development efforts with critical insights. We work with you to understand your key issues, match against the information we have and then design and execute a customized research project to give you valuable insight into specific topics. Gain valuable insights into an analytics-based custom research effort to address talent needs in learning, talent, leadership, human resources, talent acquisition, content development, measurement and other related human capital initiatives.